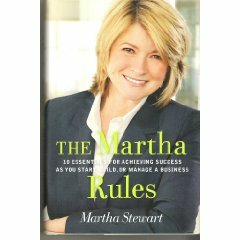 I was super excited to find “The Martha Rules” by Martha Stewart in my local Borders clearance bin a couple days ago for only $1! If there is any crafty lady who I would take business advice from, it’d be Martha, and I’m liking what I’m reading so far! Keep an eye out for it next time you are at Borders for a dollar well spent.